(Adelaide, South Australia)- In a nail biting finish that went down to the last race finish positions, Dave Suda and his crew of Herschel, Luke, Sam and Rachel sailing PACEMAKER won a well deserved 2012 National Championship by one point from Ben Lamb sailing Alyn Stevenson’s FUN 2 with last years Nationals winner Sean Kirkjian sailing SAILPAC. 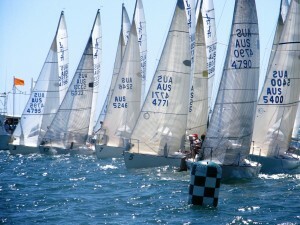 In PHS the winner was local sailor Jamie Goode from fellow SA sailor and national Measurer Peter Stevens and Dave Suda. As customary the the PHS placings can’t be won by OD place getters so third on PHS goes to Melbourne sailor and previous Nationals winner (10 years ago) Hugo Ottaway. 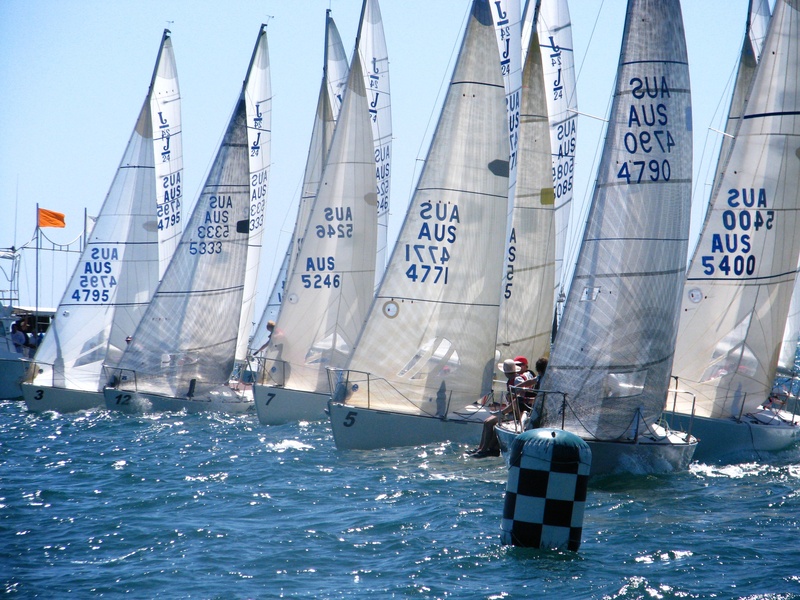 The racing was keen and extremely competitive for the fifteen boats that showed up to establish the top J/24 teams in Australia. The Cruising Yacht Club of South Australia did a fabulous job running the event. In glorious sunshine and shirts and short weather with a calm 8 knots building to a 15 knot sea breeze the fleet enjoyed superb sailing conditions. Four races were sailed on the first day and another four are planned for the second day with two on Monday. On day one, the team on FUN 2 sailed by Ben Lamb and Arthur Crothers had a bonanza day, starting out “slowly” with a 6th, then finishing with a flourish of three 1sts for a total of 9 points. Sean Kirkjian on SAILPAC also from NSW was lying second with a 2-6-2-4 and Adam Evans on SDM from Victoria was in third with a steady 3-4-4-3. Dave Suda in his new-ish Italian boat PACEMAKER cleared out in the first race to win by nearly half a leg and must have been feeling pretty good, but by the end of the day with two OCS calls was back down the results. Hugo Ottaway on BRUSCHETTA VI was also having an average series so far and dropped one of his crew over the side in the last race to add a less than perfect touch. However, the Italian boats seem to have good speed as shown by both Dave and Ben. Back in the pack, chomping on the heels of the winners, was a very close group of very good sailors. The racing is extremely tight and one small mistake takes you to the back of the pack very quickly. By the second day, racing had gotten a lot tighter, with the fleet now counting 7 of 8 races (including a drop race). At this point, Dave Suda on PACEMAKER went on a tear with two 1sts and four 2nds to get back on track and was now tied on points with Ben Lamb on FUN 2 with 10 pts apiece. Third was Adam’s SDM with 17 pts, fourth was Sean’s SAILPAC with 18 pts and fifth was Steve Girdis’ CONVICTS REVENGE with 27 pts. It was pretty the regatta was going right down to the wire on the last day of racing between the two teams tied on points for the lead- PACEMAKER and FUN 2. In the end, FUN 2′s 5-1 was no match for PACEMAKER’s consistent 2-3, giving the match to Dave Suda’s team by one point! There was also a helluva match for third on the podium, with the nod going to Sean’s SAILPAC team with Adam’s SDM team getting fourth. Rounding out the top five was Steve’s CONVICTS REVENGE.